OPEN TO LEGAL RESIDENTS OF THE UNITED STATES (EXCLUDING PUERTO RICO THE U.S. VIRGIN ISLANDS, AND OTHER COMMONWEALTHS, TERRITORIES AND POSSESSIONS), 21 YEARS OR OLDER. 1. By entering this CONTEST (the “Contest”) and accepting the terms herein, you agree to be bound by the following rules (“Official Rules”), which constitute a binding agreement between you, on one hand, and DJPG, on the other. DJPG and any website companies hosting and promoting the Contest, their respective parent companies, affiliates, subsidiaries, advertising and promotion agencies, and all of their agents, officers, directors, shareholders, employees, and agents are referred to as the Contest Entities. These Official Rules apply only to the Contest and not to any other sweepstakes or contest sponsored by DJPG. 2. ELIGIBILITY: This Contest is open only to legal residents of the United States (excluding Puerto Rico, the U.S. Virgin Islands, and other commonwealths, territories and possessions) 21 YEARS OR OLDER as of Date referenced below as the start date for the Contest (“Entrants”). Employees, and their immediate families (spouses, parents, children, siblings, and their respective spouses), including household members of Contest Entities are not eligible to enter. VOID IN PUERTO RICO, OUTSIDE OF THE UNITED STATES, AND WHERE PROHIBITED BY LAW. By entering this Contest, each entrant agrees to release and hold harmless Contest Entities from any injury, loss, death, damage, action, claim, demand or other liability that may occur from entrant’s participation in this Contest or from the acceptance, use or misuse of any prize awarded, or attendance at any event. DJPG reserves the right to verify eligibility qualifications of any winner. U.S. law governs this Contest. 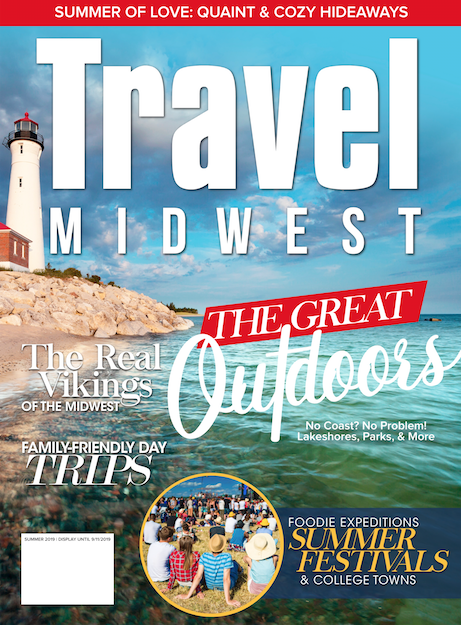 Step 1: Log on to www.travelmidwestmag.com. Step 2: Click on the “Giveaway” bar associated with the contest. 3.DJPG will then post the winning caption on the homepage and the contest page. 5. DETERMINATION OF THE WINNERS: The Winners will be selected based on the criteria set forth above from among all eligible online entries received by the deadline date. Selection of the Winner shall be conducted under the supervision of DJPG. DJPG will notify the Winner using the email address associated with your contact account. Failure to provide an accurate, working email account through which DJPG can contact you will disqualify you from receiving the contest prize. The monetary value of the prize package may vary depending upon the prizes offered at the time of contest. The prize package has no cash redemption value. Any federal and state taxes on the prize are the sole responsibility of the Winners. No substitution or transfer of prizes permitted, except at the sole discretion of DJPG. If any portion of a prize is unavailable, DJPG reserves the right to substitute that portion of a prize with a prize of equal or greater value. All prizes will be awarded. IN NO EVENT WILL DJPG, AND OR AFFILIATES AND RELATED COMPANIES, THEIR SPONSOR, ADVERTISING OR PROMOTION AGENCIES OR THEIR RESPECTIVE OFFICERS, DIRECTORS, EMPLOYEES, REPERESENTATIVES, AND AGENTS, BE RESPONSIBLE OR LIABLE FOR ANY DAMAGES OR LOSSES OF ANY KIND, INCLUDING DIRECT, INDIRECT INCIDENTAL, CONSEQUENTAL OR PUNITIVE DAMAGES ARISING OUT OF YOUR ACCESS TO AND USE OF INTERNET WEBSITE, INCLUDING BUT NOT LIMITED TO THE CONTEST, OR THE DOWNLOADING FROM AND/OR PRINTING OF MATERIAL DOWNLOADED FROM SAID SITE. WITHOUT LIMITING THE FOREGOING, EVERYTHING ON THIS SITE IS PROVIDED “AS IS” WITHOUT WARRANTY OF ANY KIND, EITHER EXPRESS, OR IMPLIED, INCLUDING BUT NOT LIMITED TO THE IMPLIED WARRANTIES OF MERCHANTABILITY, FITNESS FOR A PARTICULAR PURPOSE, OR NON-INFRINGEMENT. SOME JURISDICTIONS MAY NOT ALLOW THE LIMITATIONS OR EXCLUSION OF LIABILITY FOR INCIDENTAL OR CONSEQUENTIAL DAMAGES. ABOVE LIMITATIONS OR EXCLUSIONS MAY NOT APPLY TO YOU. CHECK YOUR LOCAL LAWS FOR ANY RESTRICTIONS OR LIMITATIONS REGARDING THESE LIMITATIONS OR EXCLUSIONS. 8. DISPUTES: As a condition of participating in this Contest, entrant agrees that any and all disputes which cannot be resolved between the parties, and causes of action arising out of or connected with this Contest, shall be resolved individually, without resort to any form of class action, exclusively, before a court located in Florida having competent jurisdiction, which Court shall apply the laws of Florida without regards for doctrines of Conflict of Law. Further, in any such dispute, under no circumstances will entrant be permitted to obtain awards for, and hereby waives all rights to claim punitive, incidental, nor consequential damages, or any other damages, including attorney’s fees, other than entrant’s actual out-of-pocket expenses (i.e., costs associated with entering this Contest), and entrant further waives all rights to have damages multiplied or increased. 9. WINNERS’ LIST: For a list of prize winners, available after May 15, 2016, send an email requesting the information to info@davidjacobspg.com. Include the words “CONTEST WINNER REQUEST” in the subject line.